Galleria Ice Rink at Hyatt Regency Dubai is a favourite place of foreigners and inhabitants of Dubai, as here they not only come to enjoy cold, but they also twirl and whirl on the ice skating area. This venue is not a new place for people, who live in Dubai or are familiar with this city, as Galleria Ice Rink is operating since 1980. Today this venue remain packed with ice skating devotees, who come here either to receive professional training or just skate for fun and show different moves. Children also come to this establishment in hefty numbers to enjoy ice skating, celebrate their birthday parties or with school trips. In brief, Galleria Ice Rink in Hyatt Regency is a place for people of all ages, where they can enjoy more as compared to any other leisure site. This venue offers various services, so fun lovers in Dubai can do lot of things at Galleria Ice Rink for instance receive professional coaching on ice skating, aside from skating at this facility. In addition to this, disco nights are also arranged in this site to enjoy cold in summer. Moreover, Galleria Ice Rink management also encourages children to visit them, as here they can celebrate their birthdays or visit in the form of school trips. To see the complete lesson charges offered at Galleria Ice Rink, click here! Dubai Museum, Sheikh Saeed Al-Maktoum House and Hyatt Golf Park. To enter in this leisure site visitors have to pay entry fee. The daily rates of entry fee from Sunday to Wednesday are 35 AED, Thursday to Saturday 40 AED, while for disco night session guests have to pay 50 AED and to learn skating a student have to pay 400 AED. Memberships are also offered at Galleria Ice Rink, as they charge 400 AED for 1 month, 850 AED for 3 months, 1300 AED for 6 months and 3100 AED for 1 year. Hyatt Regency, Deira - Dubai - United Arab Emirates. Palm Deira Metro Station 1 is located at a distance of 950 meters away from Galleria Ice Rink in Hyatt Regency, which makes it a walking journey of about 12 minutes. However, to get to this venue from Palm Deira Metro Station 1, patrons should head in the southwest course and then at the roundabout, take the 1st exit onto D 85. This will lead the metro users to a point from where they have to make a slight right turn that goes onto 27th Street. After that pedestrian will come across another roundabout, from where they have take the second exit and then go through one roundabout in order to finally make it to the destination that can be spotted on the right side after covering some distance. 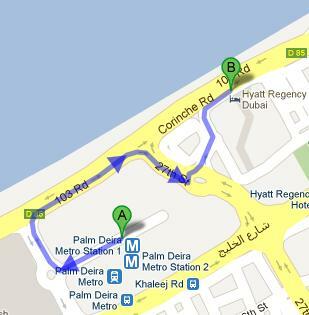 Head southwest on Al Khaleej Road/D 92 towards 27th Street, from this bus stop and then turn right onto 27th Street. After that a roundabout will come from where take the first exit and go through one roundabout, soon bus users will be able to find the destination on the right side. See map for directions.